The jewelry-like fleshy seeds of pomegranate are the most attractive to me. The seeds contain fabulous sweet, slightly tart flavour, very suitable for making refreshing juice for summer days. Well, it’s still winter here, so the first idea that came up in my mind was to make a warm soufflé to end our dinner with one of the giant pomegranates sent by Royal Pom. What else could I make good use with the other giant pomegranate? I am a kind of person who can enjoy ice-cream on a freezing, windy day. Although the weather was quite cold and wet last week, I couldn’t help craving for this beautiful pomegranate sorbet. Again, this pomegranate sorbet served as a perfect ending of my dinner last week. Use a sauce pan, pour in water, sprinkle the gelatine powder over the top. Let sit for 8 to 10 mins. Turn on the heat and cook over low heat, for about 1 minute or two. Swirl the saucepan occasionally. When the gelatine looks not grainy, add pomegranate juice, sugar. Season with a pinch of salt. Stir well. Simmer until the sugar completely dissolved. Set aside. Transfer the pomegranate mixture into a bowl, chill in a fridge. Stir in the cream. 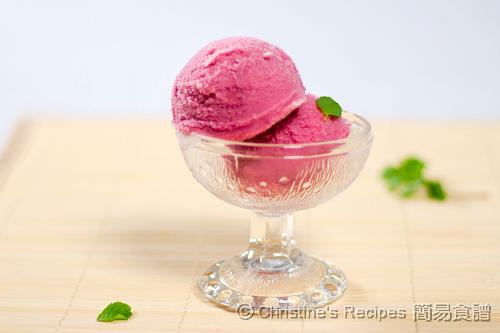 Follow the manufacturer's instructions, blend the mixture in an ice-cream maker until soft and fluffy. Then freeze until firm. Done. 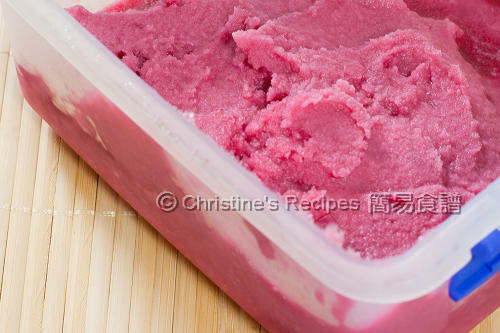 If not using ice-cream maker, you might like to whisk the mixture with a blender, then freeze until firm. Yet, don’t blend too long, lest too much air incorporated inside. WOW! I love the color of this sorbet. 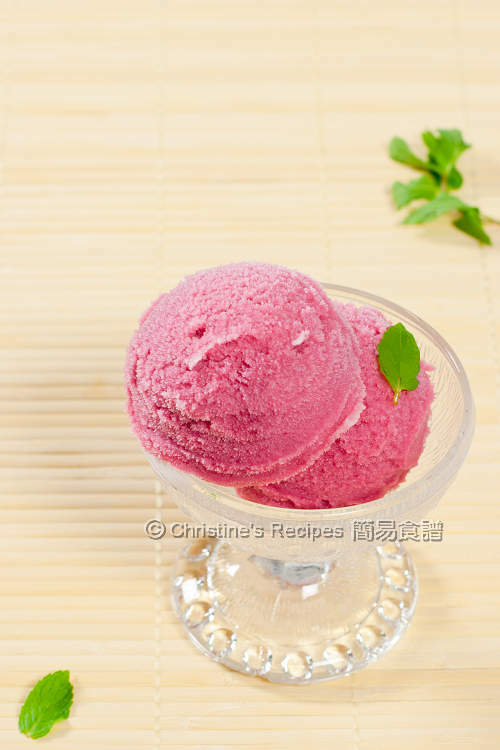 I want to have this cool pomegranate sorbet as the weather is very hot in Singapore. I love the colour too. Is it summer already up North? It's so pretty! I am sure it tasted very good too since pomegranate is one of my favorite fruits, love to pinch the little sweet juicy seeds and eat them fresh! Yum! Gosh, this colour is so attractive. This is what I would like right now to combat this crazy hazy weather. wow, the picture is very sharp and detail. which camera are you using? How lovely the colour of this sorbet!! I love pomegranate too! This looks refreshing! I like to eat cold stuff during winter too! And that sorbet looks awesomely delicious. Great job. Love how you described pomegranates...your sorbet looks so inviting and refreshing! Such a delightful sorbet! Gorgeous pink color! Wonderful!! I've never cooked with pomegranates before but you've inspired me to try it... thanks for sharing! Let me try this one out! Thanks!